These inhibitory and non-inhibitory, recombinant monoclonal antibodies are highly specific for the monoclonal antibody Fab fragment ranibizumab (Lucentis) or the complex of ranibizumab with its target, vascular endothelial growth factor A (VEGF-A). Ranibizumab was created from the same parent mouse antibody as bevacizumab (Avastin) and some of our anti-ranibizumab antibodies also detect bevacizumab (Table 1). 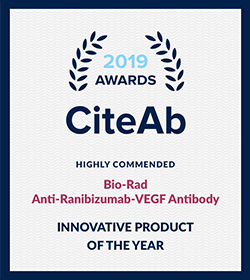 This Type 3 monovalent Fab antibody recognizes the ranibizumab-VEGF complex; it does not bind to ranibizumab or VEGF-A alone. It can be used to develop a pharmacokinetic (PK) antigen capture assay, enabling detection of free drug. These non-inhibitory Type 2 antibodies do not inhibit the binding of ranibizumab to VEGF-A, and can be used in a PK antigen capture assay, enabling detection of free drug. These two Type 1 antibodies inhibit the binding of ranibizumab to its target VEGF-A, and therefore detect free drug. The antibodies are in fully human IgG1 format and suitable as a surrogate positive control or calibration standard in an anti-drug antibody (ADA) assay. These recombinant, monoclonal antibodies are generated using Human Combinatorial Antibody Library (HuCAL®) technology and CysDisplay®, a proprietary method of phage display, and employing guided selection methods to obtain highly targeted reagents. 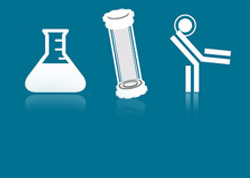 The result is highly specific and high affinity antibodies, ideal for development of PK assays. 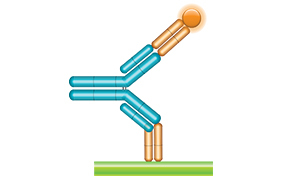 HuCAL antibodies are fully human, and when in full length IgG format they can be used as a control or calibrator in an ADA assay. The in vitro production of recombinant antibodies results in a consistent, secure supply of these critical reagents throughout preclinical development and clinical trials. 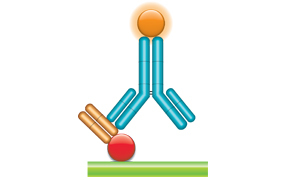 Schematic image of PK antigen capture ELISA with Type 3 antibody. Antigen/drug target (red), Fab fragment antibody drug (gold), Type 3 drug-target complex specific antibody, Fab format (purple). Fig. 1. Ranibizumab PK antigen capture ELISA using antibody HCA304. In Figure 1, a microtiter plate was coated overnight with Human Recombinant VEGF-A (PHP293) at a concentration of 5 µg/ml. Washing and blocking was performed with PBST + 5% BSA. PBST with 10% human serum spiked with increasing concentrations of ranibizumab was added. Detection was performed using Human Anti-Ranibizumab/VEGF Antibody, clone AbD29928 (HCA304) at a concentration of 2 µg/ml, followed by an HRP conjugated anti-DYKDDDDK tag antibody in HISPEC Assay Diluent (BUF049A) and QuantaBlu Fluorogenic Peroxidase Substrate. Data are shown as the mean of three measurements. 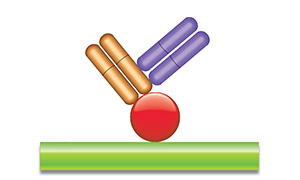 Schematic image of PK antigen capture ELISA with Type 2 antibody. Antigen/drug target (red), Fab fragment antibody drug (gold), Type 2 non-inhibitory antibody, Fab format (purple). Fig. 2. Ranibizumab PK antigen capture ELISA using antibody HCA307. In Figure 2, a microtiter plate was coated overnight with Human Recombinant VEGF-A (PHP293) at a concentration of 5 µg/ml. After washing and blocking with PBST + 5% BSA, 10% human serum was added spiked with increasing concentrations of ranibizumab. Detection was performed using Human Anti-Ranibizumab Antibody, clone AbD29865 (HCA307) at a concentration of 2 µg/ml, followed by an HRP conjugated anti-DYKDDDDK tag antibody in HISPEC Assay Diluent (BUF049A) and QuantaBlu Fluorogenic Peroxidase Substrate. Data are shown as the mean of three measurements. 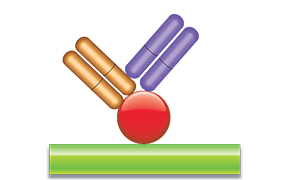 Schematic image of PK antigen capture ELISA with Type 2 antibody. Antigen/drug target (red), Fab fragment antibody drug (gold), Type 2 non-inhibitory detection antibody, Ig format (blue), labeled with HRP. Fig. 3. Ranibizumab PK antigen capture ELISA using antibody HCA316P. In Figure 3, a microtiter plate was coated overnight with Human Recombinant VEGF-A (PHP293) at a concentration of 5 µg/ml. 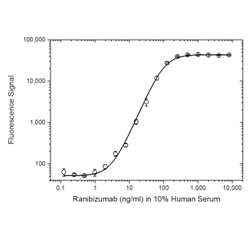 After washing and blocking with PBST + 5% BSA, 10% human serum was added spiked with increasing concentrations of ranibizumab. Detection was performed using HRP conjugated Human Anti-Ranibizumab Antibody, clone AbD29858_hIgG1 (HCA316P) at a concentration of 2 µg/ml in HISPEC Assay Diluent (BUF049A) and QuantaBlu Fluorogenic Peroxidase Substrate. Data are shown as the mean of three measurements. Schematic image of ADA bridging assay. Monoclonal Fab fragment antibody drug as capture antibody and detection antibody labeled with HRP (gold), fully human anti-idiotypic antibody, Ig format (blue). 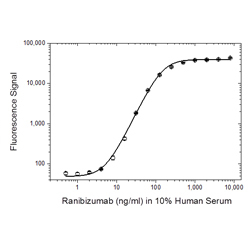 In Figure 3, ranibizumab was coated at 1 µg/ml on a microtiter plate overnight. After washing and blocking with PBST + 5% BSA, PBST with 10% human serum was added, spiked with increasing concentrations of Human Anti-Ranibizumab Antibody, clone AbD16746_hIgG1 (HCA305). Detection was performed using HRP conjugated ranibizumab at 2 µg/ml in HISPEC Assay Diluent, and QuantaBlu Fluorogenic Peroxidase Substrate. Data are shown as the mean of three measurements. HRP conjugation of ranibizumab was performed using a LYNX Rapid HRP Antibody Conjugation Kit®. In Figures 5, 6 and 7, a microtiter plate was coated overnight with various antigens and drug-target complexes at a concentration of 5 µg/ml. After washing and blocking with PBST + 5% BSA, detection was performed using an anti-ranibizumab antibody at a concentration of 2 μg/ml followed by an HRP conjugated anti-DYKDDDDK tag antibody in HISPEC Assay Diluent (BUF049A), and QuantaBlu Fluorogenic Peroxidase Substrate. Fig. 5. Specificity of Human Anti-Ranibizumab/VEGF Antibody HC304. HCA304 is a drug-target complex specific antibody that recognizes the ranibizumab/VEGF complex. It also detects the bevacizumab/VEGF complex (data not shown). Fig. 6. 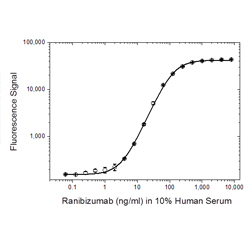 Specificity of Human Anti-Ranibizumab Antibody HC306. HCA306 is a non-inhibitory anti-idiotypic antibody, specific to ranibizumab, that does not cross-react with bevacizumab or bevacizumab/VEGF complex. Fig. 7. 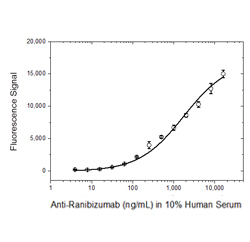 Specificity of Human Anti-Ranibizumab Antibody HC307. HCA307 is a non-inhibitory anti-idiotypic antibody, specific to ranibizumab that also recognizes bevacizumab and bevacizumab/VEGF complex.